The next five weeks will mark one of the most significant transformations in the international monetary system in over 30 years. Since the dollar is still the lynchpin of this system, the dollar itself will be affected. Whatever affects the dollar affects you, your portfolio and your personal financial security. It is vital to understand the changes underway in order to protect your net worth, and even prosper in the coming transition. Such radical transformations of the international monetary system have happened many times before, including the dual “accords” of the 1980s. These were the Plaza Accord in 1985, and the Louvre Accord in 1987 — named respectively after the Plaza Hotel in New York, and the Louvre Museum in Paris where the key meetings took place. At the Plaza Accord, the top financial officials from the U.S., U.K., West Germany, France and Japan agreed on Sept. 22, 1985, to devalue the dollar. The dollar plunged 30% in the next two years. The damage was so bad that a second meeting was called at the Louvre on Feb. 22, 1987. That meeting was attended by the top financial officials from the U.S., U.K., West Germany, France, Canada and Japan. Participants at that meeting agreed to halt the dollar’s devaluation. The dollar was relatively stable in the years following. It’s a mistake to believe the dollar’s value is set by market forces. That may be true in the short run, but in the longer run, the dollar is worth whatever governments want it to be worth. The more powerful the government, the more they can call the shots. There’s no doubt that the U.S. was the most powerful country in the world in the 1980–2000 period shown in the chart above. The Soviet Union was in terminal decline by 1987, and collapsed in 1991. China was still emerging and had a major setback with the Tiananmen Square uprising in 1989. Europe did not implement the euro until 1999. The U.S. was king of the hill. 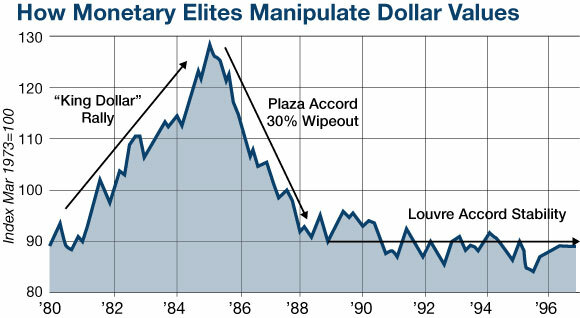 When the U.S. wanted a weaker dollar in 1985, we just dictated that result to the world in the Plaza Accord. When the U.S. wanted to lock in the cheap dollar in 1987, we dictated that result also in the Louvre Accord. Market forces had nothing to do with it. Whatever the U.S. wanted, the U.S. got. Investors were just along for the ride. Before the Plaza and Louvre Accords, there was the Smithsonian Agreement of December 1971. That was an agreement among the “Group of 10” (actually 11: U.S., U.K., Japan, Canada, France, West Germany, Belgium, Netherlands, Italy, Sweden and Switzerland) to devalue the dollar between 7% and 17% (depending on the currency pair in question). This happened shortly after President Nixon suspended the conversion of dollars for gold on Aug. 15, 1971. Nixon thought this would be a temporary suspension and that the gold standard could be resumed once the devaluation was agreed. The devaluation happened but the gold standard never returned. By January 1980, the dollar had devalued 95% when measured in the weight of gold. Even before the Smithsonian Agreement, there was Harold Wilson’s 14% sterling devaluation (1967), the Bretton Woods Conference (1944), FDR’s gold confiscation and 60% dollar devaluation (1933), U.K. abandoning the gold standard (1931), and the Genoa Conference and the Gold Exchange Standard (1922). The point is that monetary earthquakes happen from time to time. We just noted nine big ones in the past hundred years, but there were many others, including the sterling crisis of 1992 when George Soros broke the Bank of England, and the Tequila Crisis of 1994 when the Mexican peso devalued 50% in a matter of months. These monetary earthquakes move in both directions. Sometimes the dollar is a huge winner (1980–85), and sometimes it loses a large part of its value (1971–80 and 1985–87). The key for investors is to be alert to behind-the-scenes plans of the global monetary elite and anticipate the direction of the next big move. On Oct. 7, the IMF holds its annual meeting in Washington, D.C.
You might be tempted to dismiss this calendar as “business as usual.” G20 leaders’ meetings happen every year. The SDR basket has been changed many times in the past. The IMF has global meetings twice a year (spring and fall). But it’s not business as usual. This time is different. The hidden agenda involves the formal transition from a dollar standard to an SDR standard in world monetary affairs. It won’t happen overnight, but the elite decisions and seal of approval will take place at these meetings. The SDR is a source of potentially unlimited global liquidity. That’s why SDRs were invented in 1969 (when the world was seeking alternatives to the dollar), and that’s why they will be used in the imminent future. SDRs were issued in several tranches during the monetary turmoil between 1971 and 1981 before they were put back on the shelf. In 2009 (also in a time of financial crisis). A new issue of SDRs was distributed to IMF members to provide liquidity after the panic of 2008. The 2009 issuance was a case of the IMF “testing the plumbing” of the system to make sure it worked properly. With no issuance of SDRs for 28 years, from 1981–2009, the IMF wanted to rehearse the governance, computational and legal processes for issuing SDRs. The purpose was partly to alleviate liquidity concerns at the time, but also partly to make sure the system works in case a large new issuance was needed on short notice. The 2009 experience showed the system worked fine. Since 2009, the IMF has proceeded in slow steps to create a platform for massive new issuances of SDRs and the creation of a deep liquid pool of SDR-denominated assets. On Jan. 7, 2011, the IMF issued a master plan for replacing the dollar with SDRs. This included the creation of an SDR bond market, SDR dealers, and ancillary facilities such as repos, derivatives, settlement and clearance channels, and the entire apparatus of a liquid bond market. In November 2015, the Executive Committee of the IMF formally voted to admit the Chinese yuan into the basket of currencies into which an SDR is convertible. In July 2016, the IMF issued a paper calling for the creation of a private SDR bond market. These bonds are called “M-SDRs” (for market SDRs) in contrast to “O-SDRs” (for official SDRs). In August 2016, the World Bank announced that it would issue SDR-denominated bonds to private purchasers. Industrial and Commercial Bank of China (ICBC), the largest bank in China, will be the lead underwriter on the deal. Other private SDR bond issues are expected soon. On Sept. 4, 2016, the G20 leaders will meet in Hangzhou, China, under the leadership of G20 President Xi Jinping, who is also the general secretary of the Communist Party of China. In this meeting, other world leaders will metaphorically kowtow to the new Chinese emperor and recognize China as the co-head of the global monetary system alongside the U.S.
On Sept. 30, 2016, at the close of business, the inclusion of the Chinese yuan in the SDR basket goes live. On Oct. 7, 2016, the IMF will hold its annual meeting in Washington, D.C., to consider additional steps to expand the role of SDRs and make China an integral part of the new world money order. Thereafter, the international monetary elite will await the next global liquidity crisis. When that crisis arrives, there will be massive issuances of SDRs to return liquidity to the world and cause global inflation. The result will be the end of the dollar as the leading global reserve currency. 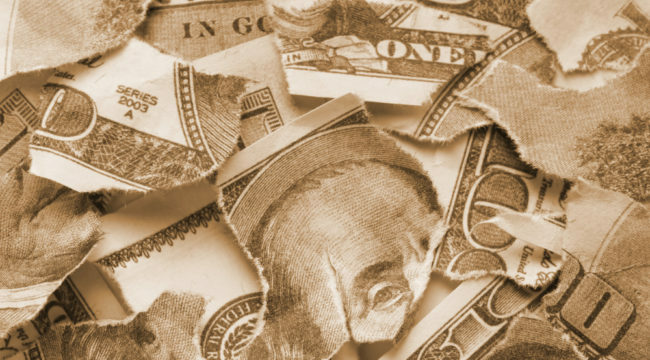 Based on past practice, we can expect that the dollar will be devalued by 50–80% in the coming years. A devaluation of this magnitude will wipe out the value of your life’s savings. You’ll still have just as many dollars, but they won’t be worth nearly as much. The time to start preparing is now.